But we’ve long contended that noise about global strife (geopolitics), inflation and most of all China/India demand need to be tuned out and the larger component planets of the Macrocosm ™ need to be respected in order to call a real bull market phase in gold and gold stocks. 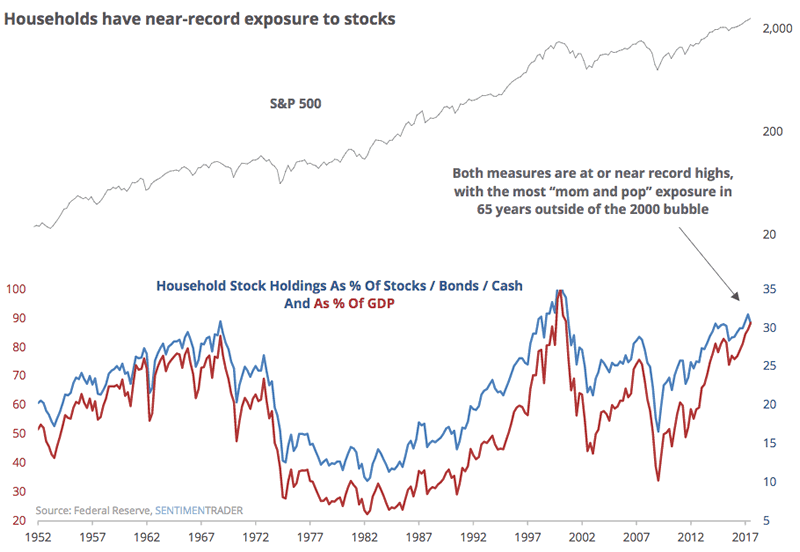 Taking a quick look at the largest components, gold vs. stock markets is still bearish and the economy – new corporate welfare tax package all but in the bag – is doing just fine. NFTRH in general and I personally am in line with this reality, long various stocks/ETFs in line with the good times. But I tell you now that Mom & Pop are very much in da house and dey is gonna be really wrong footed when the Wall Street wise guys eventually pull the rug out. 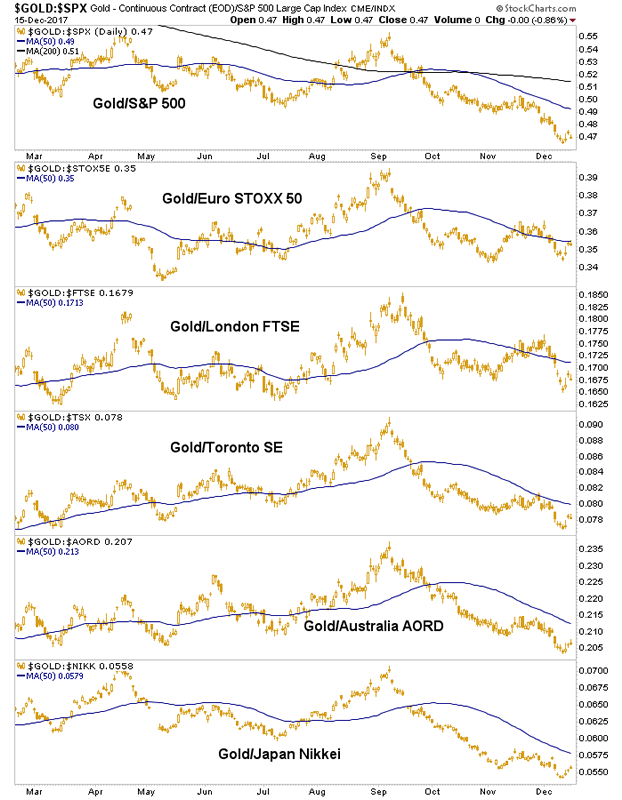 Herein would lie the case for gold and gold stocks’ fundamentals. 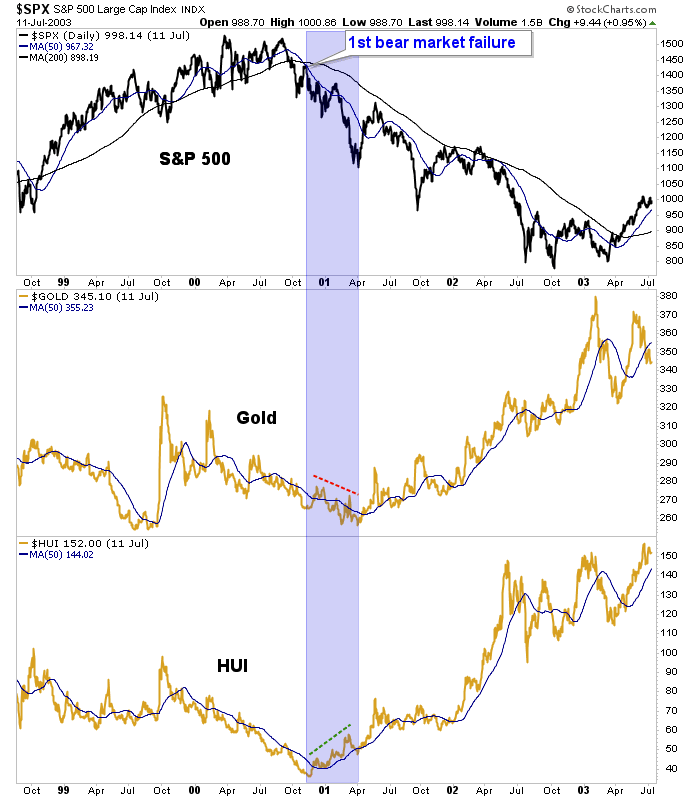 We are continually updating the 3 Amigos theme (one of which is stock markets vs. gold) in order to cross reference indicators from multiple angles; but a market watcher with common sense may well look at the information above and this chart below, and just conclude… it’s coming time. 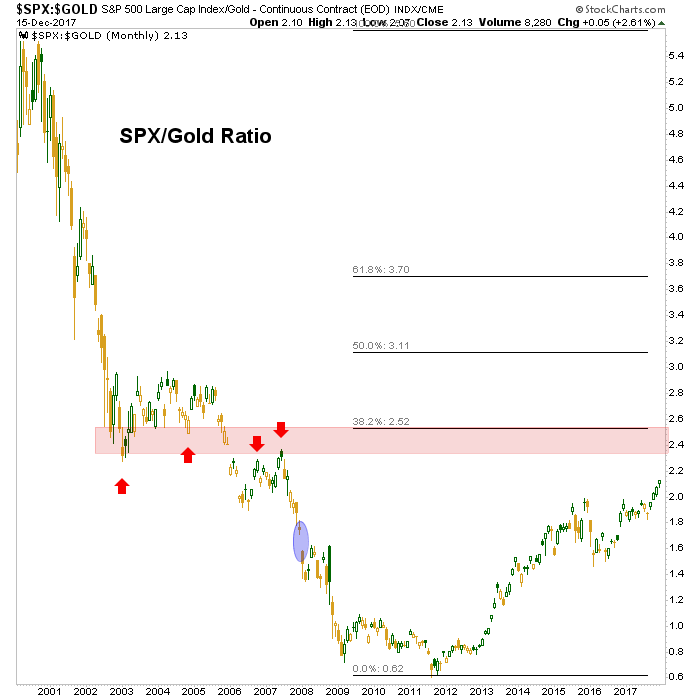 Or we can try to pick a finer point using a rather important Amigo, the S&P 500 vs. gold. Noted is a logical termination area for the wondrous, man made stock bull market that was the beneficiary of massive amounts of unconventional inflation policy, post 2008. People talk about the “Great Recession” or “Financial Crisis” as if they were one-offs. They were not. They are part of a long-term progression into economic and financial darkness. Sorry, but the closer we come to termination (see also the Yield Curve Amigo) the more I want to avoid sugary pretense that this game we have been playing is anything normal. The inflation, balls out and relentless, fed (no pun intended) right into the most desirable areas on this cycle. Asset owners were enriched (which is ironic since the administration under which this took place supposedly had a leveling of the socioeconomic playing field as its goal) and now an asset owner is president of the United States and he’s… anyone? Bueller? Anyone?… yes, he’s ramming home fiscal policy to benefit asset owners as far as the eye can see. Except that my eye sees the red shaded bar in the chart above. My eye sees Ma & Pa loading the boat to finally join the party now that we’re safe from the former commie, socialist regime. I see an epic contrarian reset of all this crap coming up, with timing the issue (again the reminder that outside of dynamic events like Q4 2008, the macro moves much slower than our relatively hyperactive human brains). But the point of my veer off into ideology and dogma is that the gold sector is going to bottom when its fundamentals utterly stink. That is because it is going to bottom when things can’t look any better for conventional players (and Ma & Pa). 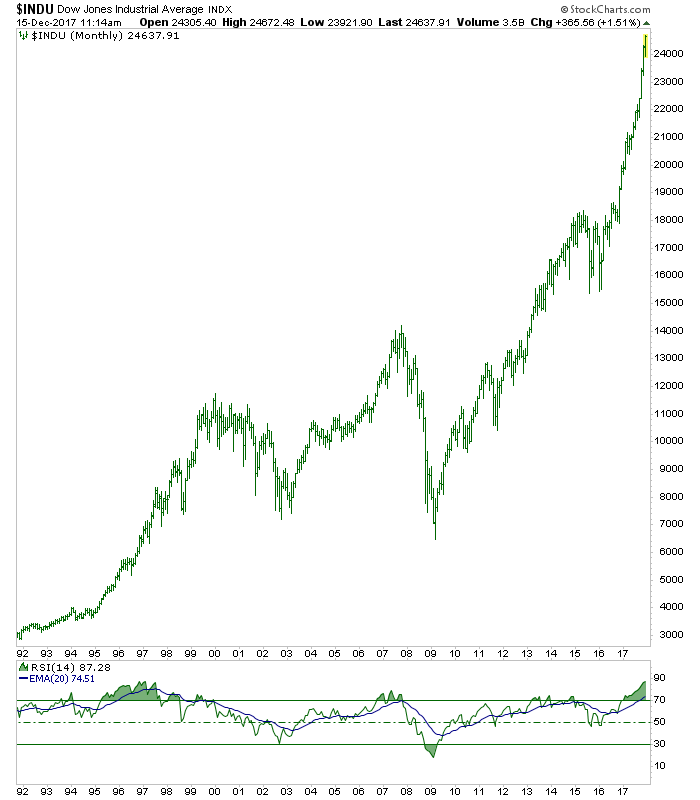 Here is a daily chart we used in a recent NFTRH report showing the situation as it was during the start of the last great bull cycle in 2000. The implication is that the stock market needs to crack and investors need to start becoming aware of a bear market (remember, Nasdaq had already cracked earlier in the year). In late 2001 the S&P 500 broke down, tested and failed. Meanwhile the gold miners diverged gold and the bull was on. So what I am doing is using short-term views like this and longer-term macro views like the 3 Amigos ™ and the Macrocosm ™ in order to be right on the spot when the real bull market begins in gold and the gold sector. It could begin sooner than we might think if the asset party blows out in spectacular fashion or it could drag for a while. So the idea is to view any coming rally in the gold sector as a bounce until some combination of macro fundamentals and/or technical milestones are exceeded. Meanwhile, I think we get a trade-worthy rally due to the seasonal aspect, a waning of tax loss selling and a cleaning of gold bug sentiment courtesy of the recent correction. Silver is where it gets interesting. 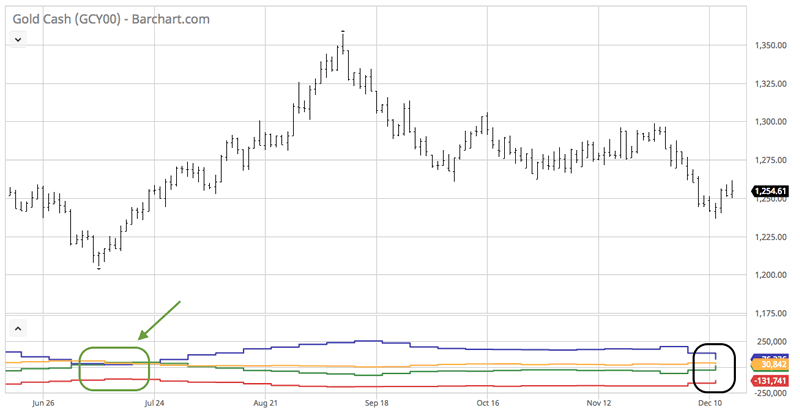 As the metal led to the downside and some very significant Commercial short covering and large Spec long reduction (to put it in a highly technical term, they puked) went on. 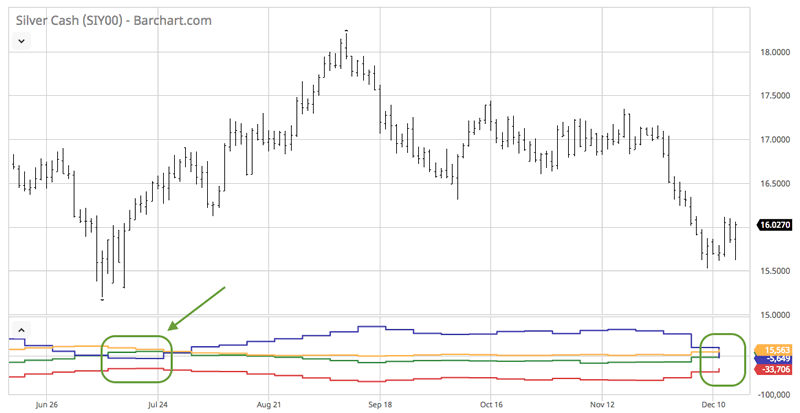 There was additional [price] downside after data collection and we can confidently state that silver’s CoT situation is now anything but dangerous. My personal plan continues to be to slowly add quality mining/royalty positions and view them as a balance to risk ‘on’ stock market positions. The plan is not yet for a major lock and load bottom. That will come after the 3 Amigos either reach their destinations or abort mission. After a noisy week with an FOMC meeting and tax bill (mini) drama, I remain 100% on plan and we’ll be charting and tracking the situation closely in NFTRH now that risk has been bled down, opportunity is out ahead and our plans seem on track all around the macro.